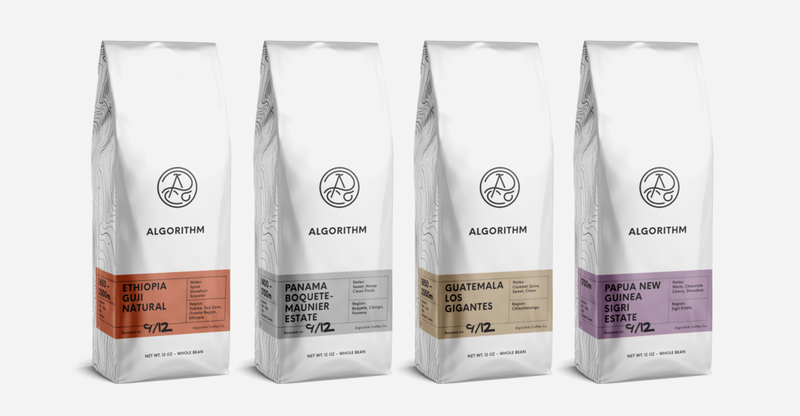 Algorithm are a pioneering leader in specialty coffee. Sourcing small lot, single origin coffees that are exceptional in flavour and also good for the environment. They use the latest coffee science and brewing technology to source, roast and brew special coffees from all over the globe, ensuring quality by working with coffee farmers who are passionately dedicated to their craft. 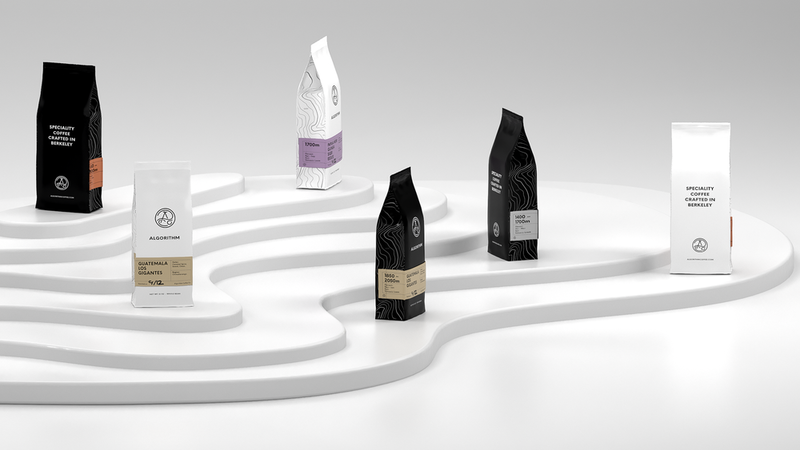 Algorithm approached us to design a new packaging style for its range of single- origin coffees. Using their existing roundel design we updated their typographic approach to be bolder, more confident and have a better standout on shelf across a range of new packaging. As the team at Algorithm source their coffee on an ongoing, seasonal basis it was important that the packaging was able reflect this. We created a flexible packaging solution for both retail and wholesale which allows them to consistently and easily update the seasonal ranges on offer. Inspired by the locations in which they source their coffee beans, we referenced mapping topography, creating a brand pattern which echoes the sinuous lines of the pre-existing logo roundel and references the remote regions where beans are harvested. To minimise the production impact we created two branded bags for retail (12oz) and wholesale (5lbs). We then created a customisable label template for application to each range. Colours were kept simple yet confident for strong shelf standout. The labels were designed to highlight information such as soil, altitude and harvesting months. Creating a flexible product range. Working with packaging suppliers Savor Brands we created a branded design which features the brand pattern on the side panels of the bags whilst allowing the new labels to be printed as required for each range and applied to wrap around the edge for further shelf visibility. The bags are printed in matte white and the product labels are printed on a metallic foil to create a tactile contrast of materials. Video courtesy of Algorithm Coffee Co. When initially considering the project we were amazed by the level of knowledge that Algorithm possess regarding the coffee they source, the regions, the altitudes, the soil types etc. We felt it was important to reference this attention to detail in any new packaging. We were inspired by the detail / graphic representation of topographic mapping to create the brand pattern and used the product labels to simply outline the specific information in a clear and concise way.